Upcountry residents spoke in outrage Tuesday night against a new state law that would outlaw all cesspools by 2050 and cost residents tens of thousands of dollars each to upgrade sewage systems during a state Department of Health meeting held at the Mayor Eddie Tam Memorial Center in Makawao. Last month, the department submitted a report to the state Legislature that identified Makawao as one of the highest-priority areas where cesspools are beginning to affect drinking water, streams or beaches. Upcountry has 7,400 cesspools that are potential threats to drinking water, and the new law requires residents to upgrade them to septic tanks or other approved treatment systems. Virtually all of the 250 residents in attendance rejected the state-mandated upgrades with some questioning the validity of the report. Many explained they do not have the money for the upgrade and plan to hand their homes down to their children and grandchildren. In the report, the department determined that Upcountry’s cesspools are contributing to “significantly elevated groundwater nitrate concentrations” in the area and downhill of the cesspools. There are five public drinking water wells in the area that are impacted by the cesspools, and there are three new drinking water wells in development. 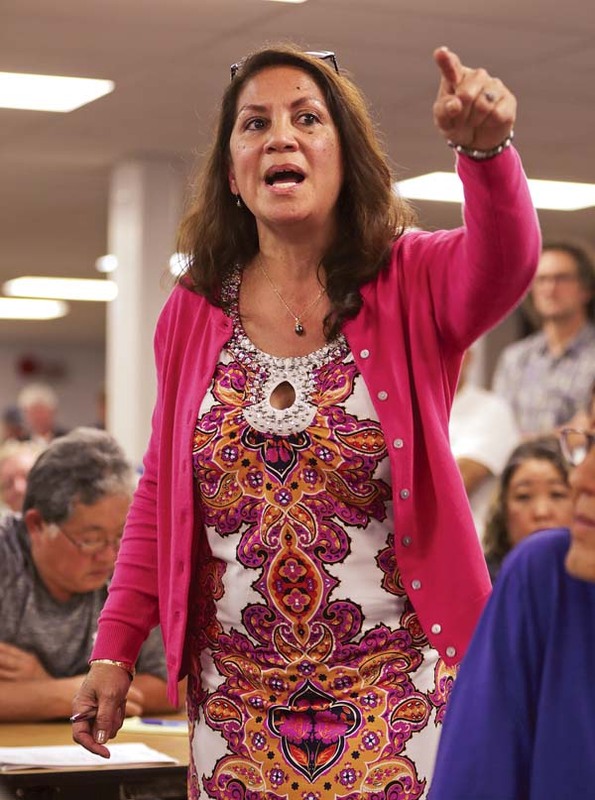 Kula resident Cynthia Razo-Porter talks to state Department of Health officials during a public meeting Tuesday night at the Mayor Eddie Tam Memorial Center in Makawao. Sina Pruder, program manager for the state wastewater branch, said the Upcountry cesspools are possibly impacting a small water system serving fewer than 100 people. She added that the cesspools make it problematic for future drinking water development as well. Health officials first discovered the elevated nitrate levels after the Baldwin estate in Haiku constructed a new drinking water well. Officials traced the nitrates back to the cesspools. While the Health Department prepared a report for the Legislature, it also is publishing an investigation on the Upcountry area. About a dozen wells were sampled as part of the report that examined various sources of nitrates. The Upcountry report is expected to be published within a month, officials said. 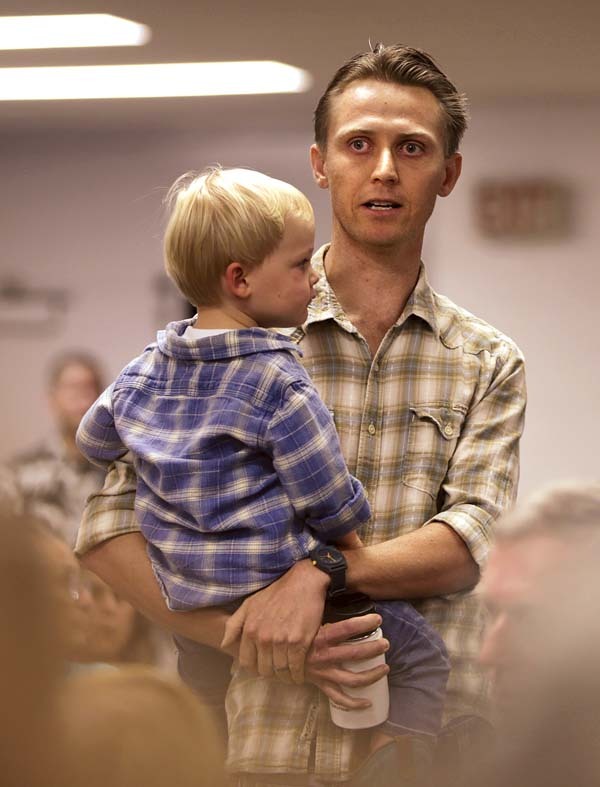 Makawao resident Eddie Schiek holds son, Quincy, while talking to state health officials Tuesday night at the Mayor Eddie Tam Memorial Center in Makawao. Some residents questioned why the department would have to condemn all cesspools, even though, only a couple of wells reported elevated nitrate levels. Upcountry resident Sean O’Keefe asked if the department could force upgrades only if the cesspools are near a drinking well that it could potentially impact. He also wondered how much money it would save residents if a nitrate treatment system were built on the wells rather than upgrade 7,400 cesspools. “Even if we disagree on whether the cesspools are or are not the problem, why don’t we think creatively about what are the most cost-effective solutions instead of saying, ‘Hey we have to replace all the cesspools,’ “ O’Keefe said. Upgrading cesspools has proven difficult for many residents, including Spence’s son-in-law, who is in the midst of a $100,000 construction job at his Makawao home. The property has no room for a septic system or leach fields. 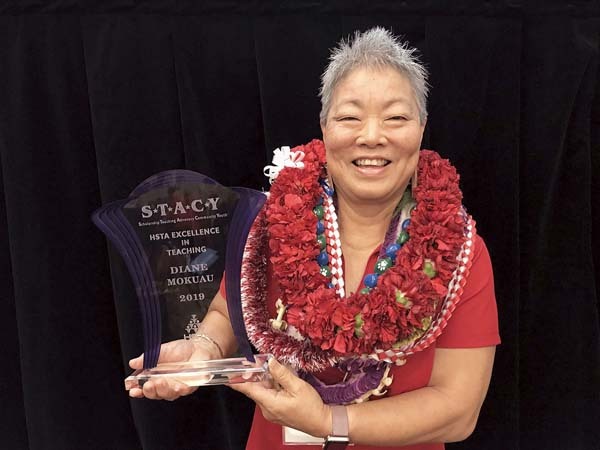 Haiku resident Rod Taylor designs septic systems with his wife, Linda, and said he goes to a property in Makawao every week, and homeowners do not have enough space. He cited setbacks, a minimum number of pits and other regulations by the Health Department that make it difficult to put in septic systems. “If we can design it on paper, the equipment operators can’t put it in,” Taylor said. “We actually were able to design one in Makawao on paper and got it permitted, and the equipment operators did a heck of a job. Taylor said the only solution the department has offered is applying for a variance, which only last five years and might not be re-approved. “You might have spent 30 grand, and now you have a system that might not get reapproved,” he said. Pruder admitted that she is “not a fan of our variance process” and may make changes to make it easier for people who want to upgrade. She also acknowledged that it may not be feasible for some residents to upgrade and believes the department can work with the counties on possibly adding a treatment plant. While officials thanked the community, they repeatedly said they were unprepared for the large crowd. Residents complained about the lack of preparedness by health officials and the lack of a microphone, which made it difficult to hear speakers. Department officials also did not have a visual presentation and ran out of printed materials. Many residents spoke out loud and over others until a resident stepped in to run the meeting. Health Director Dr. Virginia Pressler was not in attendance. Pruder said the department would return for another meeting. 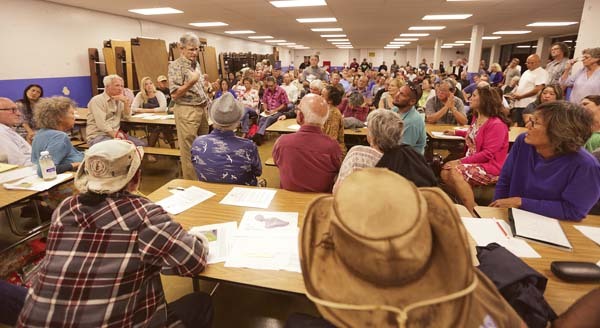 Several Maui County Council members and state legislators attended Tuesday night’s meeting and spoke with residents afterward. State Sen. J. Kalani English said the Maui delegation has been “fighting all sorts of very drastic and Draconian proposals” by the Legislature, including Act 125. It banned all new cesspools statewide. Gov. David Ige signed the wastewater system rules last year. “For the City and County of Honolulu, almost everybody is connected to a sewer treatment plant, so the standard response from Oahu is just hook up to the system.” English said. “At same time, we’re trying to educate the legislators to see the rural areas and understand the complexity of it. “People are very frustrated, and I’m very frustrated because it affects all of my district,” he said. * Chris Sugidono can be reached at csugidono@mauinews.com.